A majority of Americans believe local journalists should not express their views on local issues, but Republicans are considerably more likely than Democrats to feel this way, according to a new Pew Research Center survey that also finds substantial partisan differences over other aspects of local news reporting. Overall, 61% of U.S. adults feel that local journalists should not share their views about local issues and events, compared with 36% who say they should, according to the survey, conducted Oct. 15-Nov. 8, 2018, among nearly 35,000 U.S. adults. 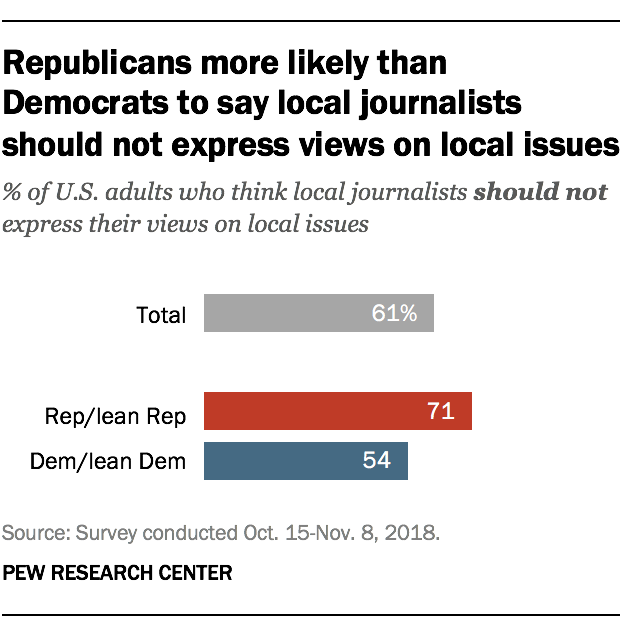 Republicans and GOP-leaning independents are more than twice as likely to say local journalists should not express their views (71%) as they are to say they should express their views on local issues (28%). Democrats and Democratic leaners are more evenly divided, with 54% saying local journalists should not express their views and 44% saying they should. The partisan divide on this question is similar to one found in an earlier Pew Research Center survey that asked whether the news media in general should present the facts with some interpretation, rather than without interpretation. While the divide between Republicans and Democrats over whether local journalists should express their views on local issues is among the largest partisan gaps found in the Center’s new survey, other measures also show substantial gaps by party. Asked whether their local news media do a good job across seven core job functions, Republicans are substantially less likely than Democrats to offer positive assessments on three of these functions (even though majorities in both groups give their local news outlets positive marks on all seven functions). 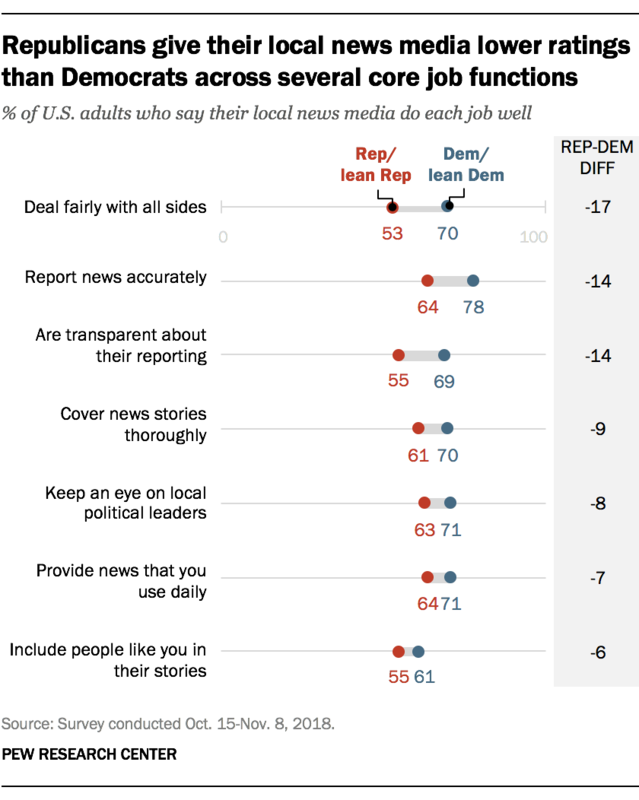 Republicans are 17 percentage points less likely than Democrats to say local news media do well at dealing fairly with all sides (53% of Republicans say this vs. 70% of Democrats). They are 14 points less likely than Democrats to say their local news media do a good job reporting news accurately (64% vs. 78%) and being transparent about their reporting (55% vs. 69%). Republicans give their local news media lower marks than Democrats on the remaining four core job functions as well – covering news thoroughly, keeping an eye on political leaders, providing news you use daily and including people like you in their stories – although the differences are smaller (between 6 and 9 percentage points). Republicans are also less confident than Democrats that their main local news source gets them the information they need, the new survey finds. About a quarter of Republicans (27%) say they are very confident in their main local news source, compared with about a third of Democrats (34%). Overall, Americans believe there should be a strong connection between local journalists and the communities they serve. But there are again some partisan differences on several measures of that connection. 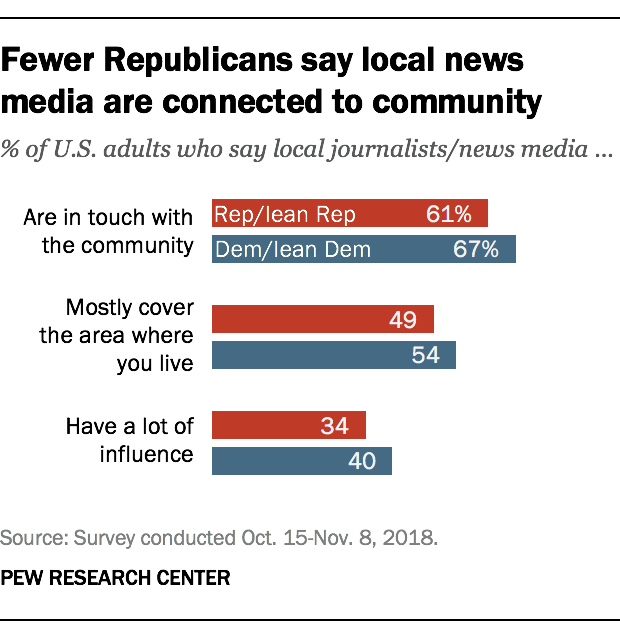 Republicans, for example, are somewhat less likely than Democrats to say local journalists are in touch with the communities they serve (61% of Republicans say this vs. 67% of Democrats) and that local news media cover the area where they live (49% vs. 54%) and have a lot of local influence (34% vs. 40%). While partisan differences over local news are noteworthy, they are in many cases much smaller than those that emerge when Americans are asked about the news media overall or national news media specifically. A survey conducted by the Center in February-March 2018 showed that Republicans are far less likely than Democrats to say the national news media do very well at keeping them informed (11% of Republicans say this vs. 27% of Democrats, not including independents who lean toward either party) and at dealing fairly with all sides (13% vs. 47%). Republicans are also much less likely than Democrats to have a lot of trust in the information they get from either national news organizations (12% vs. 35%) or local news organizations (23% vs. 37%). And they are less likely than Democrats to feel personally connected to their main source for national news (42% vs. 54%) and to say news organizations understand people like them (25% vs. 58%). There are also major partisan differences over journalists’ so-called “watchdog role” – that is, whether criticism from the news media keeps political leaders from doing things that shouldn’t be done or gets in the way of leaders doing their job. Only 38% of Republicans say such criticism keeps political leaders in line, compared with 82% of Democrats who take this view. Note: For more information, read the full report and see its methodology.